The 1970s building situated at number 15 on rue de la Confédération in Geneva, Switzerland, has recently been transformed by agency GAA - Guenin Atelier d'Architectures, appointed to renovate its facade. 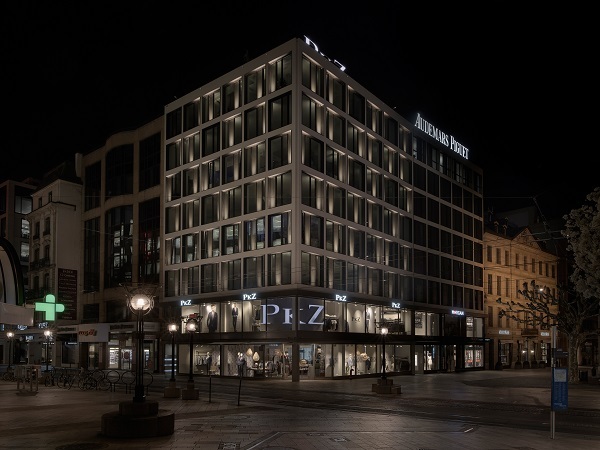 With the starting point being the buildings’ strategic position, that allows it to be seen from several important parts of the city, the architects designed a facade that draws attention both day and night. This possibility of giving the building a new modern appeal as well as functional qualities that will last over time was provided by Corian® Exteriors, an innovative solution based on Corian® Solid Surface. The facade was completely redesigned to comply with current standards of energy consumption and thermal comfort. Anodised aluminium has been used for the windows and embrasures, while the previously existing stone was replaced with Corian® Exteriors. The lattice design of the renovated façade was created to include new openings, allowing for an increased amount of natural light to reach the interior. 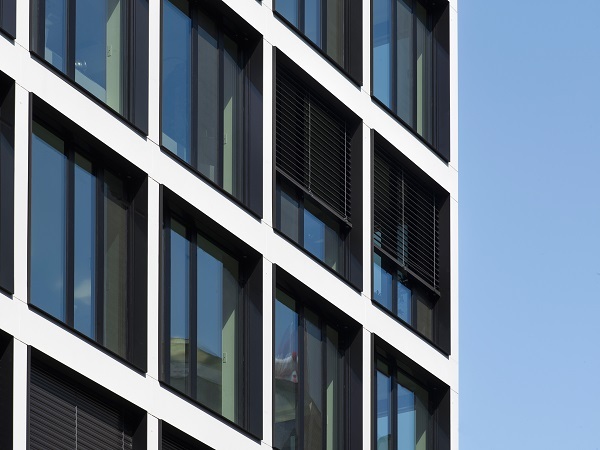 Insulating glass helps to improve energy performance and provides a distinctive feature to the facade. photo courtesy of Swen Sack, all rights reserved. "Some sections of the insulated glazing have a metal grid sandwiched between one of the windows, with the grids arranged at random on the new facade modules. The brightness of the grid in the sunshine and the contrast between the anodised aluminum and Corian® Exteriors give the facade a strong graphic appeal that varies according to the changes in light during the day. 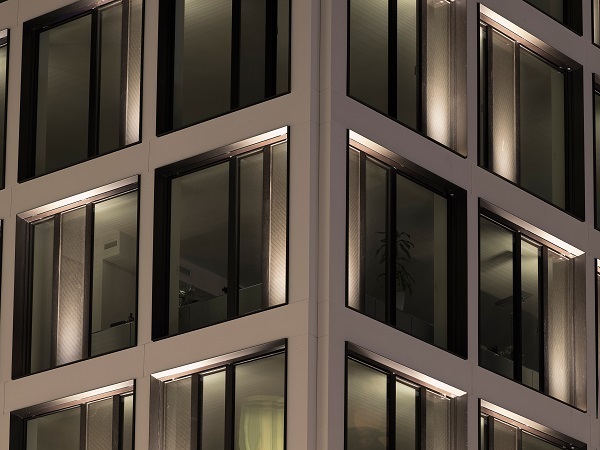 At night, with lighting solutions placed in the shelves of the windows in front of the metal gratings, the facade transforms into an urban lantern and stands out from its surroundings of unlit buildings.” GAA architects explained. Corian® Exteriors was selected by studio GAA for its technical qualities and reliability. The building’s ventilated facade is made using panels in the colour Linen that are invisibly fixed onto a framework in aluminium. Corian® Exteriors is waterproof and does not crack or deteriorate, its resistance to atmospheric conditions, including the effects of freezing and thawing, make it a long-lasting solution for exterior claddings. Facades in Corian® Exteriors are easy to clean and maintain their original beauty for many years. 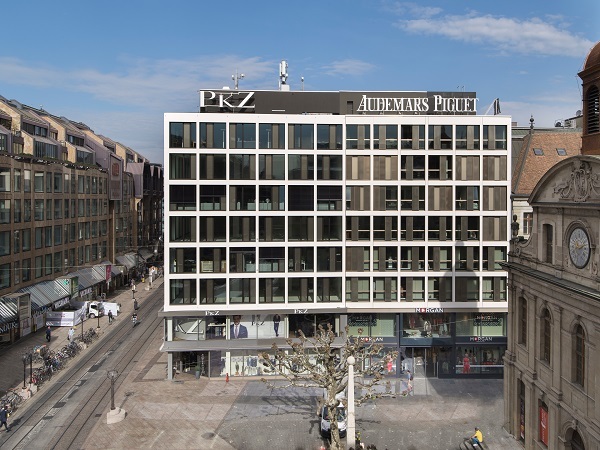 The renovation of the facade at 15 rue de la Confederation in Geneva was commissioned by Swiss company CMA Constructeurs Metalliques Associés. The outer cladding using Corian® Exteriors in the Linen colour was designed by Créa Diffusion, a Corian® Quality Network Industrial Partner. [GAA] - Guenin Atelier d'Architectures works in every field of architecture. Its projects range from the smallest of objects to large scale territorial issues, encompassing all architectural areas; from state commissioned to artistic collaborations and any work in privately owned sectors. [GAA] views each project as a new opportunity to experiment and collaborate, with the final goal being that of providing an ideal response to the set requirements and limitations. For all projects, GAA encourages a close collaboration with the client throughout the entire process to provide an end result that meets all artistic, financial and implementing expectations.